If you had any idea, even vaguely, of how hot it’s been in my classroom this week then you would understand why I haven’t put up a post since Tuesday, let alone visited any of yours. The pencils above give a pretty good indication of how things are going all around. The dear children in my class are driven to distraction with the humidity in a corner room, closed off to any possible air circulation with windows that don’t open for everyone’s “safety” in a school with no air conditioning whatsoever. Needless to say, there’s not been much reading Chez Bellezza. Taking baths and going to bed at 8:30, yes. Reading from my stack of glorious books? Not so much. But, it’s Labor Day Weekend. And I’ll be free of Labor for at least three days. Surely in that time I can post on the books I’ve received this week: The Mathematician’s Shiva by Stuart Rojsyaczer, River by Michael Ferris Smith, and We Are Not Ourselves by Matthew Thomas. Surely I can come by to see what you’ve been doing while I’ve been sweating. I know how awful it is. Before moving to Australia I worked in a Ft Myers Fl. School with no air cond. Those early days of the year were so hot. Kids lie around and sweat and the smell of all those hot little bodies. For the kife of me I don't know why the powers that be can't make schools liveable. Thinking of you. Laughed out loud at the pencils photo. I feel for you…the heat in some classrooms is inhumane! I moved from a totally new classroom with AC to an older one without…I was miserable…and to make it worse…all of the upper graves had AC…I was hateful during those times! Take care! The pencils made me laugh. My mother said she could always pick out my desk because I always had long pencils with worn out erasers. Enjoy your weekend! Holy moly. 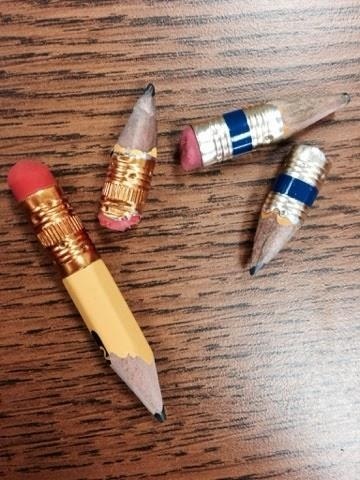 Please tell me that there are other pencils besides those in that funny/sad photo. If not, I will send your kids some pencils. I really will. Say the word. Why is it illegal to leave a child in a hot, enclosed car for an hour, but legal to confine them in hot classrooms with no air conditioning for days on end? Where are your unions? The politicians? The school boards? Never mind. Those questions are rhetorical. I laughed at that photo – they reminded me of my pencils from school 🙂 As for the heat, that is just crazy to me. How can they do that to teachers and their pupils? I'm sorry you all have to experience that. I don't think I'd be in a reading mood after enduring all that heat – hopefully you can get to some reading this weekend. It must be miserable. Turn the air up at home, and enjoy for the weekend. Seriously….no air conditioner? While we famously have no humidity in California, my own classroom has been between 83 and 84 degress all week. It's awful. I can't imagine FLORIDA with no air! Illinois is bad enough, but hat tropical humidity would be the worst. You have comforted me. Seraillon, your comments are almost as good as your posts. You cracked me up, and I am half tempted to say, “word” just to see what you would do. Now that's a good question! One I should ask the Board, I think. But then again, the School Board, the Teacher's Association (union) and politicians keep pushing the blame somewhere else. I know when they'll get air conditioning: when I retire! Your last point is a point well taken, not being able to read a book is the worst condition of all. Actually, I did a few loads yesterday afternoon. Don't tell me you have no air conditioning in your building, too? I love California whether, we were in San Diego for my son's Marine graduation a few summers ago and it was lovely. No humidity is indeed a blessing, but anything above 75 degrees starts to be miserable for this girl.